The final Top 10 lists for the 2017 long-course yards season (LCM17) have been published. The season ran from Oct 1, 2016 thru Sept 30, 2017. Swimmers from our LMSC did well: 99 ranked individual swims and 8 ranked relays. There were 34 swimmers who had at least one Top 10 swim; Shirley Loftus-Charley led the way with 8 ranked swims; impressive performances were also turned in by Greg Harris (7 swims) and Denise Letendre (6 swims). There were six swimmers who had at least one top-ranked swim in an individual event, with Johnnie Detrick taking the top spot in four events. Other top-ranked swimmers from our LMSC were Shirley, Laura Walker, Marina Falcone, Beth Schreiner, and Harrison Pierce. There was also three relays that were the best in the country in their age groups: 2 by Club Tribe and 1 by VMST. More details on these and other recent Top 10 achievements are given elsewhere on our website. Anyone making a Top 10 list can order Top 10 patches to commemorate the achievement. Nicely-formatted booklets are also available for download or order. The LMSC record book was also re-written in the past LCM season: 44 new individual records were set, led by Shirley with seven records and Craig Bauer with five. Shirley also set five new Colony Zone records, while Marina, Beth, Johnnie, Harrison, Greg, and Kristen Harris each set one zone record. There were also 6 new LMSC relay records, set by Club Tribe (4), VMST (1) and Tide (1). 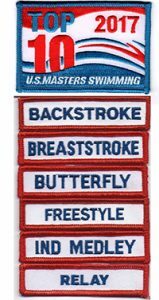 The mythical national championship rankings are based on scoring the Top 10 swims by zone, LMSC or club. As an LMSC, Virginia was ranked 15th out of the 52 LMSCs. At the club level, VMST was ranked 27th and Club Tribe 32nd out of 277 clubs that had swimmers in the Top 10. Wow!